Quantum Stones’ Signature Genesis Amulet line is finally here! Each stone is infused with 3 powerful harmonics using our very own one-of-a-kind quantum scalar waves and frequency programs – Sound of the Sun, Sound of Earth, and Shield My Aura. 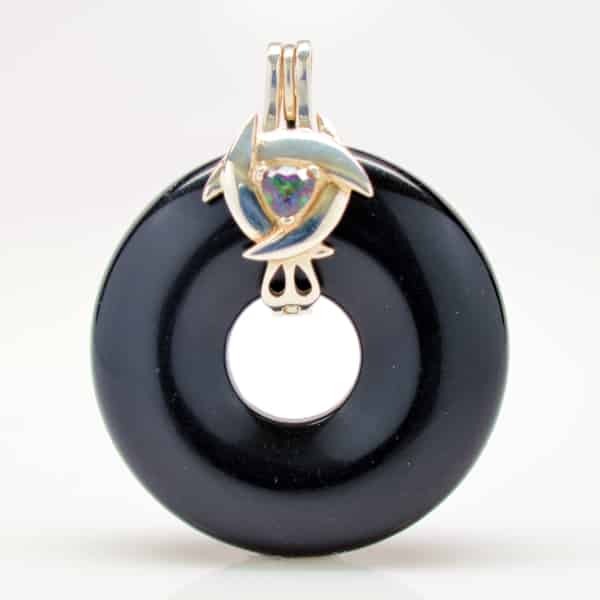 Often used as a gazing stone for prophecy seekers, the Black Obsidian Genesis Amulet is also a powerful cleanser of psychic smog that may clout the aura. This grounding stone protects the possessor from evasive negative energies and helps one release disharmonious vibrations, resentments, fears, and pent up anger. Resonates strongly with the base chakras to promote contentedness and centering and balance of the auric fields. Infused with 3 powerful harmonic frequencies, each amulet arrives gift-ready with a free leather cord and a free Sterling Silver Bail with a healing crystal of your choice – Mystic Green Quartz, and Clear Quartz. Clear Quartz: Amplifies the vibrational energy of all stones to promote higher chakra activation and tapping into astral realms…perfectly complements any amulet. Mystic Green: A natural Clear Quartz that has been coated, giving it a unique rainbow color effect. It has the same healing properties as Clear Quartz.